Richard Isles was born in Bradford, Yorkshire in around 1892. His parents were Ezra and Sarah Ann (nee Brotherton) who had married at St Peter (Bradford Cathedral) on 7th February 1880. Richard had five siblings, and at the time of the 1911 census was living with his parents and elder sister, Agnes, at Pembroke Cottage, Lytham. On 17th May 1910, when he was 18 years four months old Richard joined the Territorial Army on a four year engagement and continued to work as a gardener. He was given the service number 993 (and in 1917 the new style number 200195). During his pre-war time with the Territorials he attended the annual training camps in 1910, 1911, 1912 (promoted to Corporal) and 1913; he was part of the winning Tug-of-War team during these camps as pictured below. 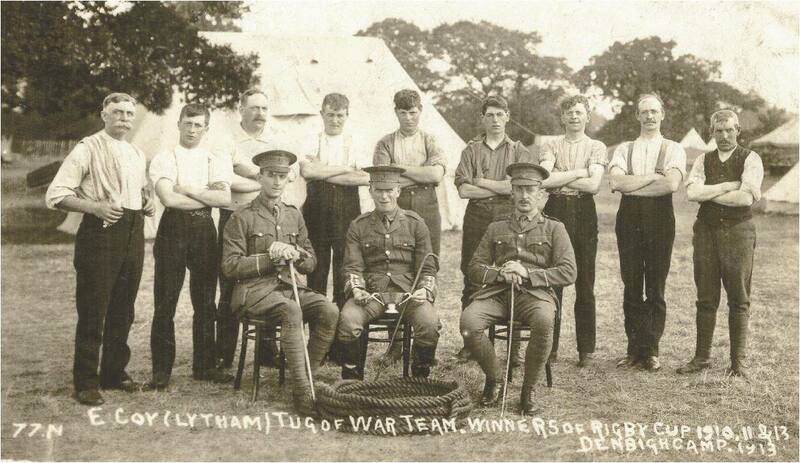 Private Richard Isles at Denbigh Camp in 1913 having won the annual Tug-of-War competition with E Company (Lytham) . Richard was due to complete his term with the military in May 1914, however the month before this date arrived he was promoted to Serjeant and extended his terms of service for a further year. When war broke out later that year he was posted into ‘C’ Company of the 1/4th Battalion. On 4th May 1915 Richard sailed with the main body of the 1/4th Battalion to France, and on 18th May 1915 he was reprimanded by C.S.M Edwards and Captain Widdows for ‘Neglect of duty whilst Company Orderly Serjeant’. On 15th June 1915 he was wounded in action, attacking enemy positions between Rue d’Overt and Chapelle St. Roch, sustaining shrapnel wounds to his right leg. At 18:00 hrs the attack was launched by the 4th Loyal North Lancashire and the 6th Scottish Rifles.. The attack was at first successful; the west end of the German salient was carried, and the attack pushed on to the main German line near the Rue d’Overt, and for a time the third German trench was occupied and held. Unfortunately the attack by the Division on the right of the 51st made little or no progress, and when night fell the 154th Brigade had penetrated the German line on a narrow front, but had both its flanks in the air. The attack consequently failed, but as stated in the Divisional History, “great praise is due to the 154th Infantry Brigade for their advance in the face of heavy artillery and close range rifle and machine gun fire. There is little doubt that had the operations on the flanks been successful, they would have had every prospect of holding their gains. Richard was taken to the hospital in Boulogne before being returned to England twelve days later for treatment. Having recovered from his injury, in April 1916 Richard joined the 3/4th Battalion at South Shore, Blackpool. On 21st October 1916 he re-engaged for a further four years and was given a £15 bounty, five pounds of which he received ‘up-front’. On Christmas day 1916 Richard sailed from Folkestone back to France, arriving early boxing day morning at Boulogne. He rejoined the 1/4th Battalion in early January 1917 and was appointed Acting Company Sejeant Major. In April that year he was made substantive in this rank. On 21st July 1917 Company Serjeant Major Richard Isles was killed in action at Ypres. The Regimental History explains ‘On the 21st we suffered rather heavily from enemy artillery, a single shell hitting 9 men, our total casualties on that day being 1 1 killed and 14 wounded, of whom 2 afterwards died— our worst day since the SOMME’. ….he was killed after returning to the reserve trenches from front line. Artillery was fired and hit the reserve trenches killing him and others. C.S.M Richard Isles was buried with honour in the Vlamertinghe Military Cemetery. He was just twenty-five years old. In late 1917, his mother penned a letter to request that Richard’s personal property was returned to her. She was at this time living at Ivy Lawn, Windsor Road, Ansdell, Lytham and received his pocket wallet, photographs, letters and cards. As his father had died in 1915, his mother took receipt of their late-son’s 1914/15 Star, British War Medal and Victory Medal. She would also have received the memorial plaque and scroll in recognition of his sacrifice. Regiment/Service: The Loyal North Lancashire Regiment, 1st/4th Bn.